WDM optical networks need multiplexer (MUX) and demultiplexer (DEMUX) to combine and split the multi-wavelength optical signals. The MUX is used to join signals together at the transmitter, while the DEMUX) is used to split signals apart at the receiver. CWDM networks use CWDM modules such as CWDM MUX/DEMUX and CWDM OADM. DWDM networks use DWDM modules such as DWDM MUX/DEMUX and DWDM OADM. Fiber-Mart provides a series of WDM modules which enable the expansion of existing fiber capacity. 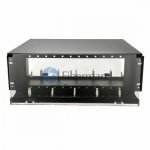 Our CWDM DWDM OADM modules are available with three packagings: ABS Pigtail Module, Rack Chassis and LGX Cassette.